Who Is Chumlee, Why Was He Arrested, Is He Dead, What is His Net Worth? Chumlee is known to millions of people as a star on the reality show Pawn Stars. But before he actually broke into stardom, he was already a worker at Gold & Silver Pawn Shop, which is owned by Rick Harrison, the father of his childhood friend Corey Harrison. The Pawn Stars personality began working in the shop at age 21 after trying his hands on several odd jobs in the city. He had his big break after he was cast as a member of the reality show which has been running on the History Channel since July 2009. Chumlee is often depicted on the show as a comic foil and, he is regarded as one of the show’s stars to have enjoyed a reasonable amount of screen time ever since it began airing in 2009. He is currently in a relationship with Tanya Hyjazi, a prominent cook at Las Vegas’ Stack Restaurant and Bar. The pair has been dating since 2013. This popular American actor was born as Austin Lee Russell on September 8, 1982. According to records, his place of birth was in Henderson, Nevada. The Caucasian got the nickname “Chumlee” at the age of 12 due to his broad jaw and face. He has a brother called Sage Russell and a beautiful sister known as Terra Russell. At the moment, there’s no information about Chumlee’s education but we gathered that he did a couple of odd jobs after high school. Austin Russell’s arrest took place on March 9, 2016, when he was apprehended and detained on weapon and gun charges. It was reported that the police recovered illegal firearms including shotguns, MP5, handguns, and other kinds of rifles when they raided the reality TV star’s home. Also found in Chumlee’s apartment were methamphetamine and marijuana. The cops bumped into the items when they stormed his house to serve a warrant in a sexual assault case. In the long run, the Pawn Stars’ bloke was slammed with a one-count charge of possessing a firearm and 19 charges of drug possession. He pleaded guilty in court and was then released the following day. The star was, however, advised to see a counsellor and sentenced to three years probation. Meanwhile, the sexual assault charges against him were dropped by the prosecutors. Russell owes his meteoric rise to fame to the reality show – Pawn Stars. Though his salary from the Gold and Silver Pawn Shop is yet to be made public, unverified reports have it that he receives a pay above $25,000 per episode. 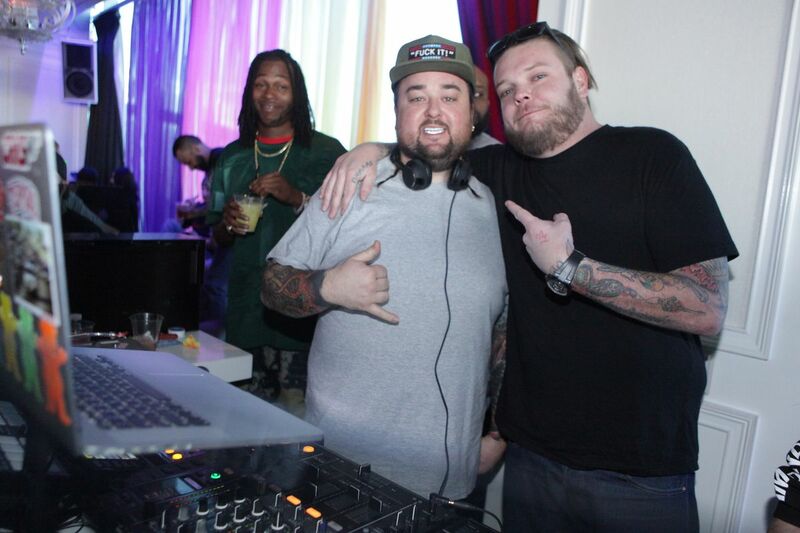 Chumlee has been featuring on the reality show for over eight years, following the show’s debut in 2009. This goes a long way to tell how much he has made from his roles over the years. Sometime in 2010, it was reported that Chumlee sold half of his stake to Pawn Stars’ co-founder, Rick Harrison for $155,000. At that time, the reality show was still in its infancy. The Pawn Stars bigshot also has his personal company which produces and sells various novelty items and merchandise products such as designed T-shirts. Within the Pawn Stars Show family, Chumlee, to date, holds the record as the owner of the highest amount of merchandise sales. The star owns a candy shop which he manages with his brother Saga Russell. Situated at Pawn Plaza in Las Vegas, the shop – Chumlee’s Candy on the Boulevard – opens from Wednesdays to Saturday between noon to 5:00 p.m. In addition to the reality show, Austin has also starred in a good number of other television shows. Some of them are American Restoration (2010), Katie (2013), Live! With Kelly and Michael (2012), Counting Cars, Lip Service (2013), Top Gear USA (2011) and much more. Mr Russel currently lives in a fashionable apartment in Las Vegas. The property boasts an outdoor swimming pool and a large garage for his cars – a ’64 Impala, Roll Royce, Maserati GranTurismo, a White Range Rover and Cadillac Escalade. Russell’s wealth is valued at $5 million. The American star is very much alive and kicking strong. Unfortunately, he was once a victim of celebrity death hoax as he was reported to have died of a heart attack in his apartment sometime in 2014. The rumour later turned out to be false, Chumlee and his manager debunked the story via their respective Twitter accounts.